A decision handed down by a New York judge over the Thanksgiving holiday weekend bolstered most of the key arguments in the state attorney general’s lawsuit against the Donald J. Trump Foundation. Scarpulla’s ruling was a green light allowing the case to proceed, exposing Trump to millions of dollars in potential penalties. Trump’s legal team must file a response within 45 days of her decision. Here’s what you need to know about Scarpulla’s assessment of the case. Citing the landmark Clinton v. Jones Supreme Court ruling and the more recent decision in a former Apprentice star’s defamation suit against Trump, Scarpulla confirmed that sitting U.S. presidents can be sued. “I find that I have jurisdiction over Mr. Trump,” Scarpulla wrote. She dismissed as “meritless” the Trump team’s claims that a federal court would be better suited to handle the matter, given that the entire case hinges on New York state charity laws. Trump and his team have made much of the notion that disgraced former Attorney General Eric Schneiderman, who initiated the investigation of the Foundation, was unfairly biased against the President. But Scarpulla agreed with Underwood’s office’s counter-argument: that investigating potential charitable fraud is well within the purview of the attorney general’s office, and that their findings were legitimate. She had hinted in court that she was uninterested in getting sucked into any partisan bickering related to the Republican president and ousted Democratic attorney general. Scarpulla determined that a January 2016 Iowa fundraiser Trump held to raise money for veterans appeared to provide him with free publicity that boosted his presidential bid. The attorney general’s office “sufficiently alleges that Mr. Trump’s interest in the alleged acts of self-dealing were financial in nature and were substantial,” she wrote. Trump held the event just days ahead of the Iowa caucuses in lieu of attending a GOP primary debate, asking wealthy friends to donate millions to veterans’ groups and directly to the foundation. 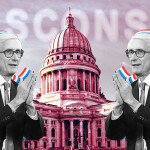 His campaign built the website that managed the funds and dictated which organizations received them, and Trump disbursed the money at a series of campaign rallies across the state. Scarpulla rejected the Trump’s team’s claims that he was merely a “passive recipient” of the funds. Trump’s attorneys have said Underwood’s office can’t prove he knew that what he was doing was improper. But Scarpulla said that the evidence they offered sufficed to move forward with the case. That included Trump signing foundation checks for veterans and then presenting them at rallies, and using his campaign to disburse those funds. “These allegations sufficiently support a claim that Mr. Trump intentionally used Foundation assets for his private interests knowing that it may not be in the Foundation’s best interest,” Scarpulla said. Trump’s attorneys have insisted that he was acting in his “individual capacity” when he appeared at campaign events carrying foundation checks, and therefore was not violating a ban on charities engaging in political activity. But to make that legal argument, Trump would have had to avoid making “partisan statements” at these public appearances. Instead, he appeared at a MAGA-festooned podium, boasted about how the events could boost his political performance, and mocked his Republican primary opponents. “Moreover, considering the allegations of coordination between the Campaign and Foundation, as well as the control and authority that Mr. Trump and the Campaign allegedly wielded over the Foundation, the petition adequately alleges that the political acts by Mr. Trump and the Campaign are attributable to the Foundation,” Scarpulla added. After months of foot-dragging and goalpost-shifting, attorneys for President Trump have finally turned over answers to Special Counsel Robert Mueller’s written questions about Trump’s knowledge of Russian interference in the 2016 election. What happens next is not quite clear. The questions did not focus on Trump’s actions post-inauguration, and Mueller wants more information as part of his investigation into Trump’s possible obstruction of justice. So the special counsel could either drop the matter, relying instead on other information he’s already obtained, or move forward with a subpoena against the President. If Mueller does go the subpoena route, the independence of acting Attorney General Matt Whitaker and the increasingly conservative leanings of the Supreme Court come into play, as Politico reported. Questions have continued to swirl about Whitaker’s appointment, with even Sen. Lindsey Graham (R-SC) admitting that Whitaker’s past criticism of the special counsel probe would be “problematic” to his Senate confirmation. The former hot tub marketer’s work history would also likely be a source of concern during the confirmation process. New financial disclosure forms, which Whitaker had to revise five times, show that he earned $904,000 for his work at a conservative think tank that targeted Hillary Clinton. A handful of Graham’s Democratic colleagues — Sens. Mazie Hirono (HI), Sheldon Whitehouse (RI) and Richard Blumenthal (CT) — have filed a lawsuit in federal court alleging that Whitaker’s appointment was unconstitutional precisely because he was not Senate-confirmed for the post. Jerome Corsi, a conspiracy theorist and Roger Stone associate, is not always the most reliable source, but he says he is negotiating a plea deal with Mueller’s team — a statement that comes after months of indications that Mueller is closing in on him. A Corsi deal would bring Mueller quite a bit closer to investigating Stone’s claims of a relationship with Wikileaks during the 2016 election. Mueller is also going after George Papadopoulos, slapping down the former Trump campaign aide’s bid to not serve the jail time he agreed to as part of a plea agreement. As the special counsel noted, Papadopoulos expressed remorse for lying to the FBI at his sentencing hearing, then launched a publicity tour claiming he’d been entrapped and regretted pleading guilty. New York comic and Roger Stone ally Randy Credico has another meeting with Mueller’s team after Thanksgiving. That detail adds more fodder to predictions that Stone and/or some of his associates could be indicted for possibly coordinating with WikiLeaks during the 2016 campaign. Election Day’s strong showing for Democrats in the House, where they initially appeared to have flipped 27 seats to retake control, turned out to be just the beginning of their building blue wave. These are the Proud Boys. 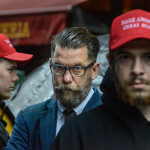 Established during the 2016 presidential election by Vice co-founder Gavin McInnes (pictured above), the group — which McInnes sometimes refers to as a “gang” — bills itself as a fraternal organization devoted to “western chauvinist” values. The group grew out of informal meetings in New York City dive bars, where fellow travelers gathered over beers to complain about feminism and the “myth” of racism. A defining characteristic of the Proud Boys is an enthusiastic embrace of the racist, sexist and homophobic views that drove Vice and McInnes to cut ties in 2008. In the name of opposing political correctness, they dismiss transgender people as diseased, women as housewives, and immigrants as criminals. They say that this posture is all in good fun, but they also have a record of getting cozy with career racists. McInnes has written articles for VDare.com and American Renaissance, publications run by open white nationalists. The founding of the Proud Boys was announced in Sept. 2016 in Taki Magazine, a far-right publication formerly run by Richard Spencer. “Unite the Right” organizer Jason Kessler was a Proud Boy until he was excommunicated from the group after his event saw dozens of counter-protesters injured and Heather Heyer killed. Proud Boys have engaged in violent street fights on the streets of Portland, and most recently earned headlines for brawling with anti-racist activists outside a Manhattan GOP club where McInnes made a speech. That’s the context needed to understand the group. The Proud Boys’ goofy founding mythology helps conceal the legitimate danger they pose among the men’s rights activists, alt-righters, white nationalists, neo-Nazis, trolls, and other far-right malcontents. But there is plenty to mock. Their name, for example, comes from “Proud of Your Boy,” a song cut from the 1992 “Aladdin” Disney film. The song, in which Aladdin apologizes for being a “louse and a loafer,” ended up becoming an important part of the stage production — a version of which McInnes saw at his daughter’s school recital. To McInnes, the “fake, humble and self-serving” lyrics were a comment on the sad state of American masculinity. Then there are the vows, required to “level up” to successive degrees of membership. Level 2: Allow your fellow Proud Boys to beat you until you manage to yell out the names of five breakfast cereals. Also give up masturbation to avoid draining your sexual energy. Level 3: Get a Proud Boys tattoo in a specific font. Level 4 and beyond involves physical violence. Though McInnes claims this is purely in the context of self-defense, he’s also “joked” that the fourth degree involves “kicking the crap out of antifa” — a suggestion his supporters have eagerly acted out. In brief, McInnes and his crew want to engage in hateful rhetoric and violence, while retaining the ability to cast the whole thing as “ironic” when they face scrutiny. Expect to see their name again. With the midterm elections firmly in the rearview, the prospect of an indictment from special counsel Robert Mueller’s team is again hanging over the White House. President Trump is reportedly lashing out behind closed doors — and, also, in full view of the entire world. Contributing to the angst at 1600 Pennsylvania Avenue: Politico reported Michael Cohen was spotted with his attorneys at D.C.’s Union Station this week, prompting speculation that he was in town to meet with Mueller’s lawyers yet again. The target of the next indictment could well be WikiLeaks founder Julian Assange. In a filing unrelated to the Russia probe, a Justice Department prosecutor accidentally let slip that charges had been prepared against Assange. Ousted Attorney General Jeff Sessions considered Assange a major target of his anti-leaker crusade. The WikiLeaks founder is also at the center of a web linking the Trump campaign to the Russia probe. Conspiracy theorist and Roger Stone ally Jerome Corsi claimed this week that he, too, expects to be indicted because he was caught in a “perjury trap” during his 40-plus hours of interviews with Mueller’s team. It’s hard to know how much credence to give to the claims of the guy who founded Birtherism. Stone is under investigation for witness intimidation for his interactions with New York comic Randy Credico, and messages surfaced by NBC show them discussing the demise of Hillary Clinton’s campaign days before WikiLeaks started releasing John Podesta’s emails. Concerns still linger that the new acting attorney general, Matt Whitaker, will derail the Mueller probe. He’s trying to assuage them, telling Sen. Lindsey Graham (R-SC) that he has no plans to kill the investigation and insisting that he won’t starve it of funds. Mueller’s team is getting fed up with Paul Manafort’s level of cooperation, with sources telling ABC News that they’re “not getting what they want” from Trump’s former campaign chairman. In the Russian troll farm case, a judge declined this week to toss a conspiracy charge against the firm but warned that Mueller’s team would need to go to extraordinary lengths to prove its case at trial. Federal prosecutors in D.C. are also in negotiations with accused Russian agent Mariia Butina for the “potential resolution” of her case, which she again asked to be dismissed this week. In a bit of lawyer-related news, the attorneys who shepherded George Papadopoulos through his federal criminal case are cutting ties, saying he’s hired other representation to deal “with any issues related to the criminal case following his sentencing.” And Michael Avenatti, former lawyer to Stormy Daniels and thorn in the side of Michael Cohen, was arrested this week on domestic violence charges. He denied the allegations. After a bitterly fought, high-stakes week of lawsuits and recounts, Florida Sen. Bill Nelson (D) appears to have officially lost his reelection race to Republican Gov. Rick Scott. GOP Florida Gov. 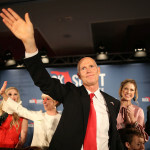 Rick Scott pledged Wednesday to recuse himself from certifying election results in his high-stakes race to replace Democratic Sen. Bill Nelson.